Fender Bass VI Model Electric 6-String Bass Guitar (1971), made in Fullerton, California, serial # 346160, black finish, alder body, maple neck with rosewood fingerboard, black hard shell case. This instrument is quite a rarity -- not only one of the latest Fender Bass VIs we have ever seen, but a very seldom seen custom color as well. Although moderately popular in the early 1960s, by the beginning of the 1970s the Bass VI was built only in miniscule numbers. The neck on this instrument bears no date markings, but the pots are stamped 304-7051, indicating the bass was likely assembled in 1971. By this point, the Bass VI was still featured in the Fender catalogs but built only when ordered, and was headed for discontinuation a few years later. Ten years earlier, the Fender VI (that is its original official name, though it is universally called the "Bass VI" today) had been the company's big instrument unveiling at the July 1961 NAMM show, but it never caught on in a major way despite being a very well-engineered and useful instrument -- as six-string basses go! 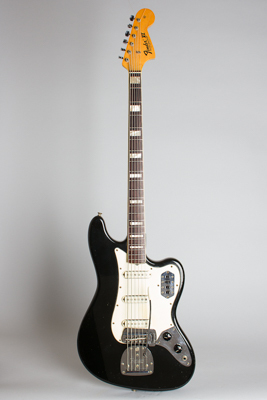 Apart from its "CBS" black-logo decal on a non-matched color headstock (the matching head was discontinued around 1970), this VI has mostly the same features of the mid-1960s model. The pickups and electronics are similar to Jaguar practice, with the magnetic "claw" fitting underneath and simple and effective on/off switching for each. The fourth "strangle" switch was added to the wiring rig in 1963, cutting lows to allow for a more guitar-like tonality in any pickup setting. The body features a striking jet black finish, still in the late-1960s style lacquer and not yet the heavy "thick skin" polyester that slightly later Fenders are swathed in. The rosewood fingerboard is bound and pearloid-block inlaid, as it had been since the summer of 1966, and the neck is finished in clear poly. The 3-layer white plastic pickguard confirms this as an original custom-color bass, as the standard sunburst versions used tortoise shell pattern plastic. Late-production Bass VIs like this one are quite rare; especially in a custom color. Despite being seen in this period with bands as diverse as Glen Campbell, the Beatles (quite a bit, actually), Brian Auger's Trinity, Fleetwood Mac, and the Soft Machine, the instrument was generally considered a relic of the twangy early '60s and became increasingly unfashionable. This superb custom-color example is not only a serious rarity but a great-sounding and playing six-string bass with an amazingly wide range of tones from its three pickups, and even a vibrato arm to play with, if you dare. A supremely cool and possibly unique example of one of our favorite instruments. Overall length is 44 3/4 in. (113.7 cm. ), 14 in. (35.6 cm.) wide at lower bout, and 1 5/8 in. (4.1 cm.) in depth, measured at side of rim. Scale length is 30 in. (762 mm.). Width of nut is 1 1/2 in. (38 mm.). This bass is overall very clean and all original, with no repairs, heavy wear, or modifications. There are a few dings here and there to the finish, but the only large area of loss is to the back, where a moderate-sized spot of belt buckle wear has been touched up (maybe more than once!). The clear neck finish, frets, and fingerboard show little wear at all, and it looks like this Bass VI saw only limited use when new. All hardware is original and complete except for the snap-on bridge cover which has gone missing, and the pad for the mute. Despite being built heavily into CBS era turf, this is a fine-sounding and playing example, and sonically the pickups are the same as ever. Except for the polyester neck finish and headstock livery, this 1971 VI is very little changed from 1966 era examples. This late-model Bass VI is a super sharp-looking instrument in its striking black & white livery, and a very rare and cool Fender that you really hardly ever see. Includes a recent oblong HSC. Excellent Condition.